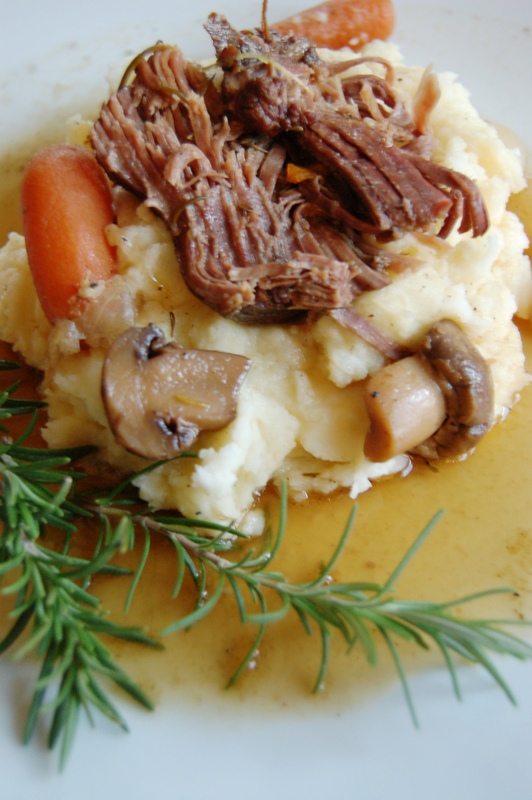 Who doesn’t love pot roast? Well, I suppose some of my vegetarian friends are not fans, but most everyone else I know deems pot roast as the ultimate comfort food. 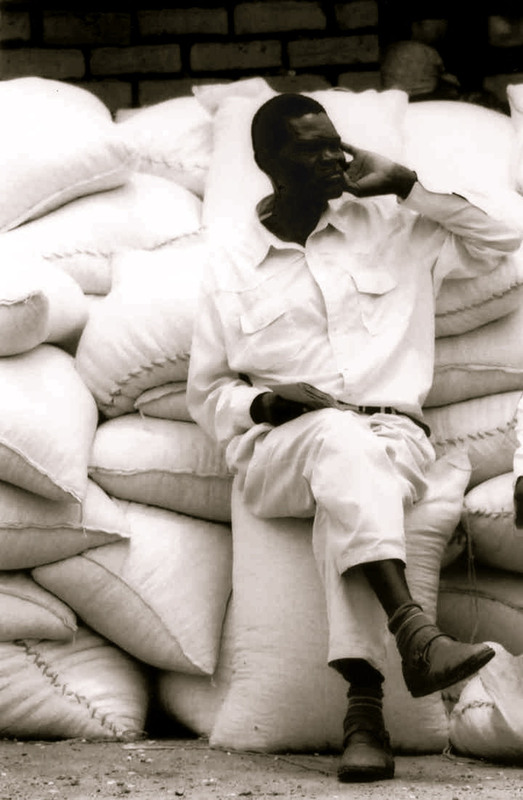 However, I have heard many friends complain that they have not been successful… that often the meat comes out tough! 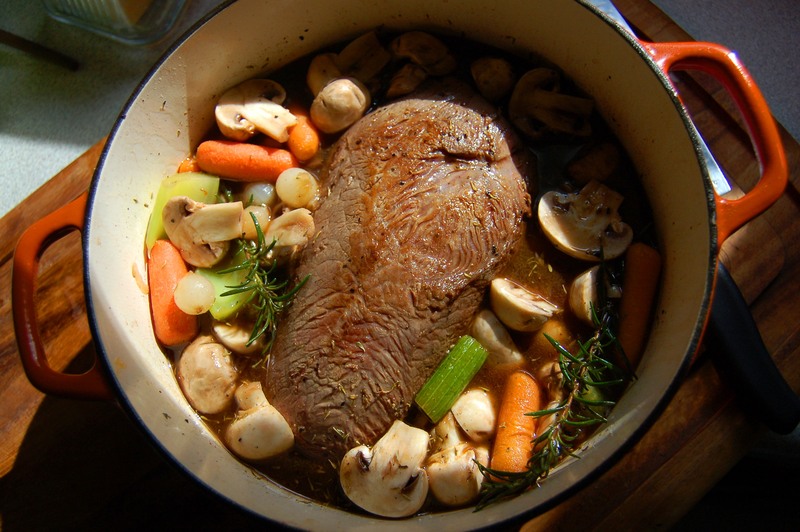 Contrary to belief, tough pot roast is not a result of over-cooking… but of UNDER-cooking! And the science of that is not always consistent. 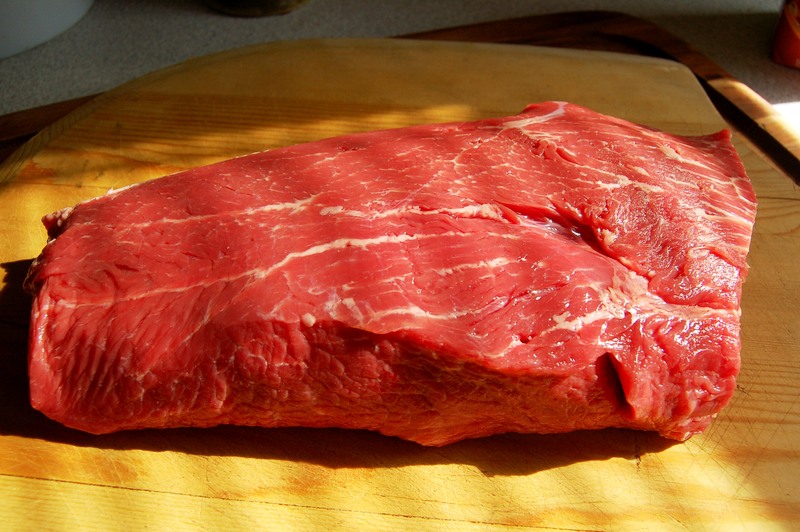 For example, the rule of thumb is to cook low and slow, about 1 hour per pound of meat. But temperatures in ovens vary and sometimes the weather can throw everything off… so shoot for an hour per pound, but if it’s not falling apart tender then put it back in and check it every 20 minutes. I had a small 2lb roast this time, yet it took 3 hours. You just never know. But the longer in the oven the more the connective tissues break down and turn into succulent deliciousness. Because of the intimidation factor so many feel when facing The Pot Roast… I took a lot of extra photos for some step-by-step assurance of what things should look like. Scroll through the photos with my comments and then read all of the directions before beginning… so you will feel confident as you go along. This is actually a very simple and inexpensive meal – so relax! And in 3-5 hours your patience will pay off and you’ll have an amazing meal to serve your family and friends. 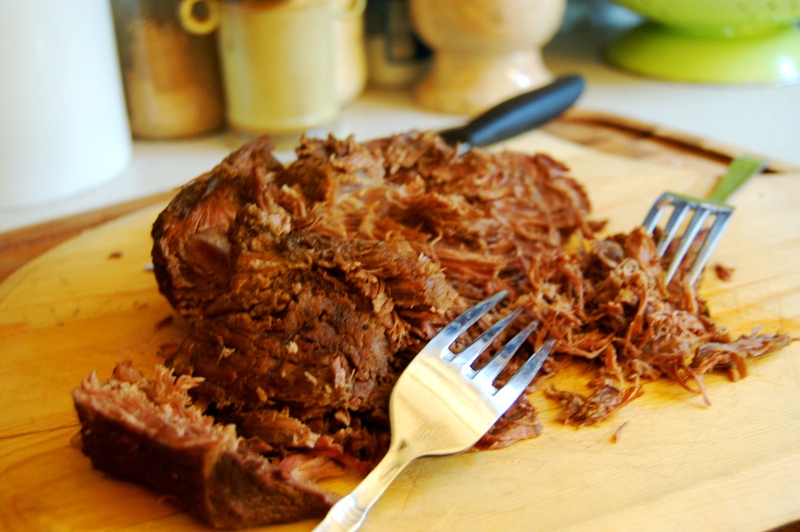 I chose a bottom round tender cut – but you can use a chuck roast as well. Look for good marbling. GENEROUSLY salt and pepper both sides! The other side had a layer of fat – don’t be tempted to remove this – you will need this for browning and it will render away! Put this side in the pan first. Start by lightly browning your vegetables in a teaspoon of oil. Then remove from the pan. Then put the meat in the same pan (fat side down). Add a touch more oil if needed. Brown on each side – I stand it on the ends to get every side, Only a few minutes per side is needed. You want a good caramelized browning. Now return everything to the pot! Add beef stock until it’s about half way up the meat. You know your meat is done when it easily pulls apart with forks. Voila! Great over mashed potatoes or rice or even egg noodles. Choose a nicely marbled piece of meat. Although there IS flavor in the fat – I chose the bottom round because it’s a little bit leaner. But make sure you do see a decent amount of marbling. 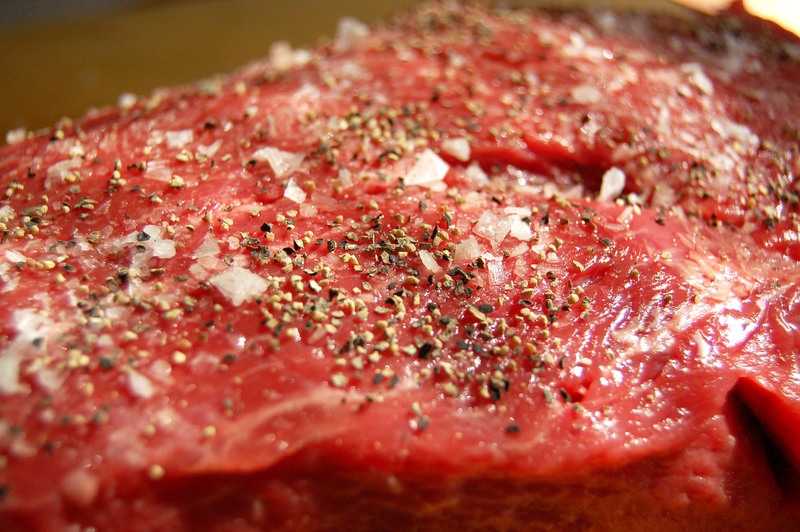 Salt and pepper both sides of your meat. Heat 3 tablespoons of oil in a large pot over medium-high heat. I use a ceramic-covered cast iron pot. It needs to a heavy, stove-to-oven pot. 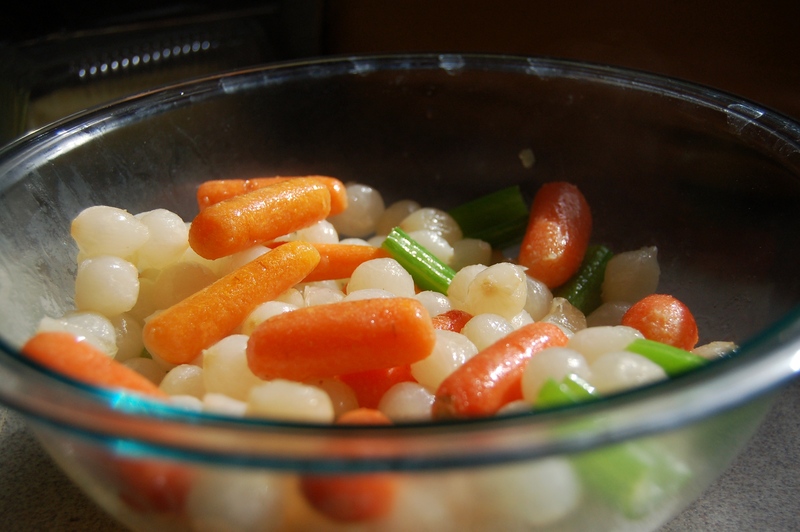 Peel and cut onions in quarters and cut the carrots and celery stalks into 1-inch slices. Clean and slice mushrooms. When the oil is hot, add in the onions, carrots and celery browning them on one side and then the other. About 3-4 minutes. Remove the veggies to a plate. Repeat process with the mushrooms, though for less than a minute (do not cook thoroughly). If needed, add more oil to the pan. Place the meat in the pan (fat side down) and sear it for about a minute on all sides until it is nice and brown all over. Remove and set the roast aside. With the burner still on high, use either red wine (about 1 cup) to de-glaze the pan, scraping the bottom with a whisk or wooden spoon to get all of that flavor up. 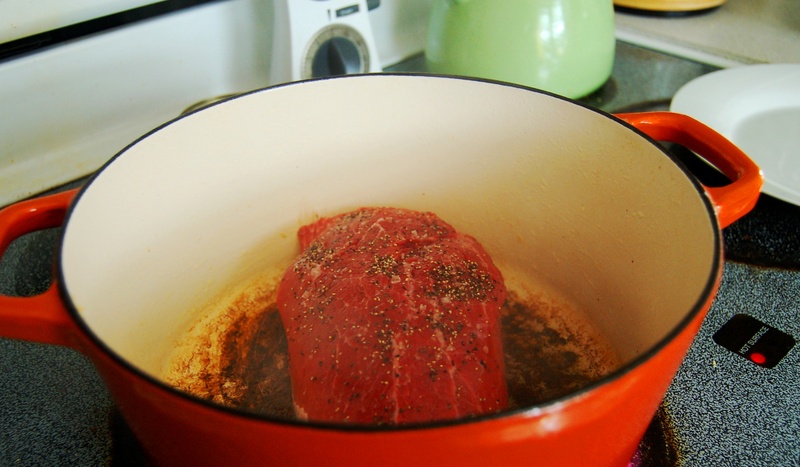 Place the roast back into the pan and add enough beef stock to cover the meat halfway (about 2 to 3 cups). Add in the vegetables, as well as the sprigs of fresh rosemary and thyme. Cover pot with its lid and place in a 275 degree oven for 4-5 hours (roughly an hour per pound). 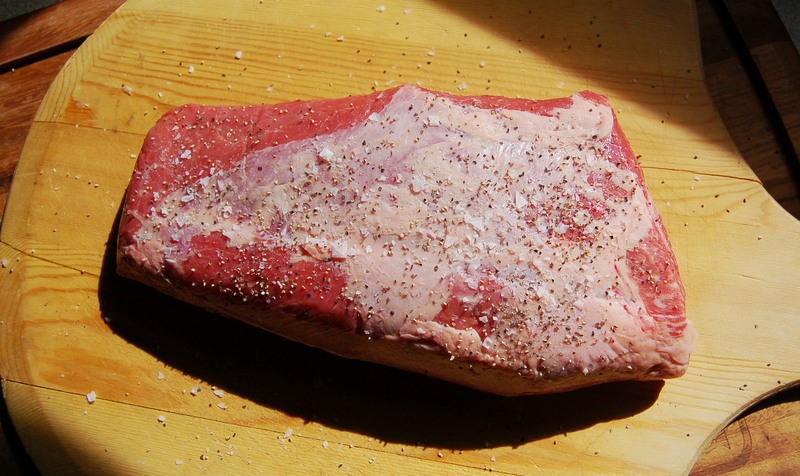 Transfer meat to a cutting board. Test it using two forks to pull meat apart. Is it easy? Then you did it! A little tough? Put it back in and test every 20 minutes. 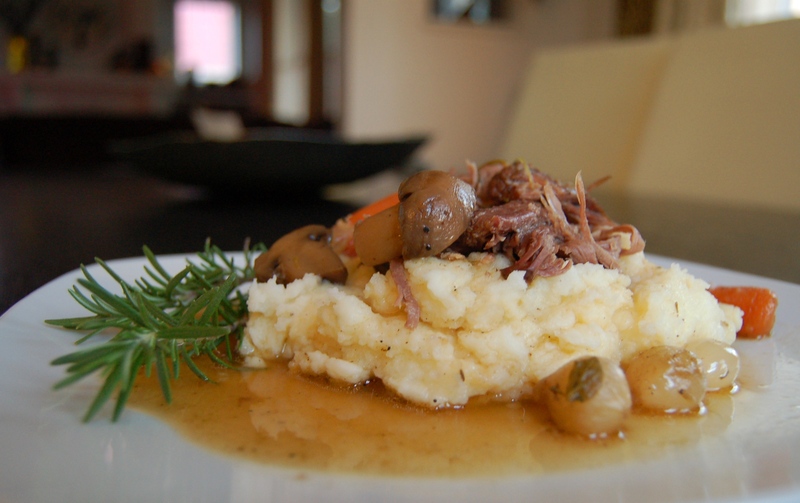 Once done, cut meat into chunks and serve with the vegetables over mashed potatoes (or other favorite starch). Be sure to pour the juices over the top. Uh-Mazing! This is a perfect opportunity to stack your fork with a little bit of everything… swirl it in the juices and let it all melt in your mouth. I used the Rex Goliath Pinot Noir to cook with as well as paired it with the meal. This is a very heavy, rich plate and needs a lighter touch to accompany it. It’s smooth and velvety dry with a harmonic blend of black cherry with a touch of vanilla that stays on the tongue to produce a pleasant finish. This dish is packed with vegetables and if you did like I did and your veg ratio to meat is much greater… then scoop up a few ladles full of veg and some broth and throw it all on the blender. Puree until smooth and use this instead of making a gravy with flour. Much healthier and incredibly tasty! Keep adding broth until you reach your desired consistency. Thanks Deb! 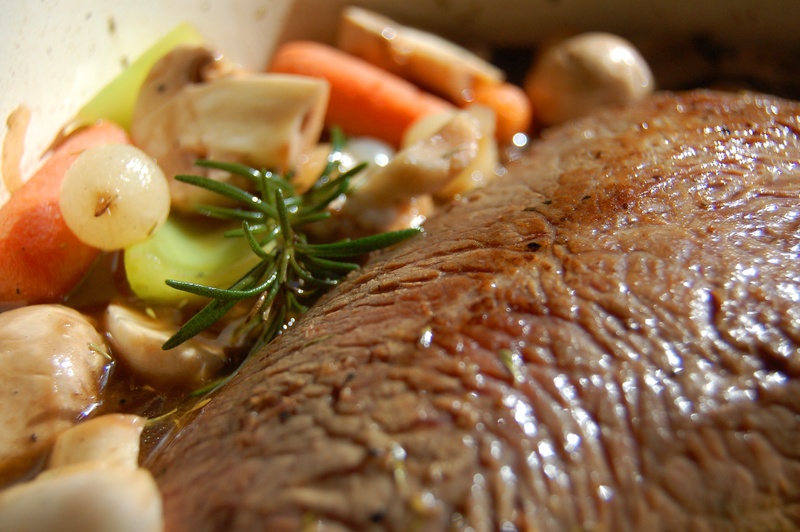 I used this recipe last week on a deer roast. Since deer doesn’t have much fat at all I used bacon grease to saute the veggies and to brown the roast. I also cooked it in the crock pot for about 4 hours on low and 2 hours on high. It was so good! I served it with brown rice.